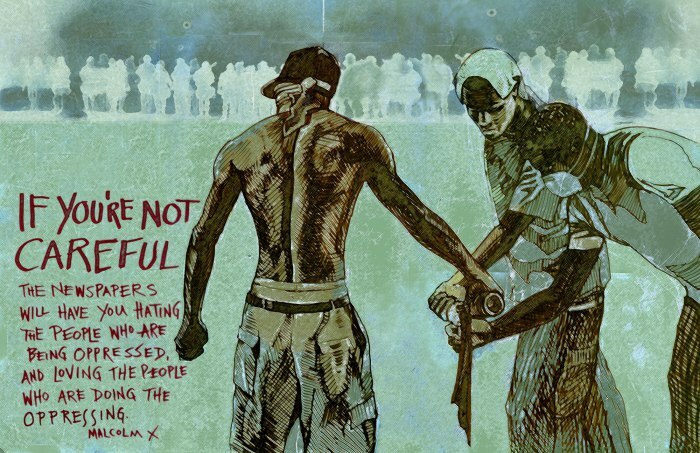 New poster to raise money for those arrested in Ferguson. A new poster, by artist Corina Dross, about the uprisings in Ferguson is being sold to raise money for the bail and legal fund for those arrested. The folks at Ferguson and Further have also produced two new posters inspired by the uprisings. Please print and cover the walls. Also check out their list of zines about other anti-cop struggles. It’s been a week since the police shooting of Michael Brown, an unarmed black man in the St. Louis suburb of Ferguson. The images and sounds of the struggle in the streets have ripped open the mainstream media to dialogue around police use of force, discrepancies between how different races and classes in the U.S. experience that force and the lack of transparency and legitimacy on behalf of law enforcement. Solidarity has been expressed from communities around the world, even by folks in Gaza, with the people of Ferguson and the family of Mr. Brown who’ve suffered this loss and continually live under the gun of the state in Missouri. This week we talk to Luka, a white anarchist from St. Louis who’s been going to Ferguson and meeting folks and being in the streets with them, building relationships. Ferguson is a majority black city whose police force is 94% white. Luka talks about their experience of conversation with and struggle alongside of folks from a personal more than political standpoint, across racial lines. Luka gives a narrative of the days between the shooting of Mike Mike through Friday evening (08/15/14), when we spoke. There’s discussion of police and protest tactics and how they’ve changed in the face of a week of gassing and rubber bullets met with molotovs and rocks.